Tormenter Anglers, Personally, I have been catching around 70% - 80% of all my Dolphin the last several years on Daisy Chains. We only started marketing them (Sept 2011) after I woke up and realized exactly how productive they were. Time and time again, we caught 9 of 9 fish trolling on one, then 8 of 9, then 7 of 9, then 6 of 7, etc. I went from fishing one Daisy Chain at a time to two Daisy Chains, and now I am trolling three Daisy Chains in my six line spread. I fish these three in a V-Pattern close to the boat with the closest one only around 25 feet from the transom and the other two about 15 - 20 feet behind the hook bait of the closest one. I will then fish two lures around 20 feet behind the hook baits of the back Chains. This makes five (baits). I then fish either a Steel Head, Tuna Plug, Bullnose Bubbler, or Smoker Junior down the center around 150 - 175 feet back (WFB). Tormenter Tackle has the world's best selection of Daisy Chains and Spreader Bar Rigs. We have a tremendous assortment of different combinations offered so that you can feel confident in your spread whether trolling for Tuna, Trolling for Marlin, Fishing for Dolphin, and even Wahoo. If you would like a combination that is not shown, please email us at sales@tormentertackle.com and we will rig it up for you custom. Nowhere can you find more choices in Daisy Chain rigs! How and Why Use Daisy Chains? Stainles Steel 7691 Tuna Hook. Comes ready to deploy in our premium 8 x 8 Lure Bag. 7691 Stainless Steel Double Strength Tuna Hook. It comes ready to deploy in our 8 x8 inch lure bag. 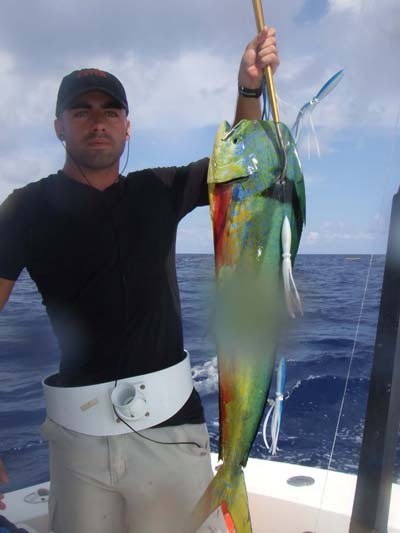 Catches: Mahi, Tuna, Wahoo, Billfish, and more! 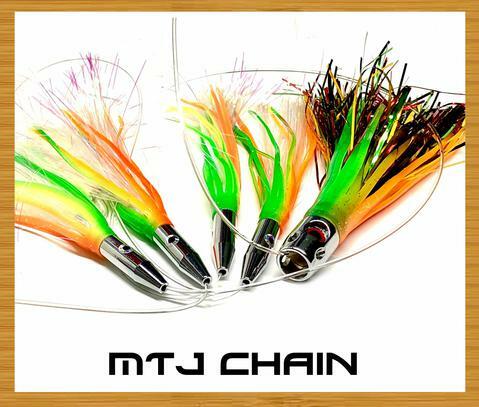 This is our BEST Chain for Southern Blackfin and Yellowfin Tuna! Available in six super hot colors! With or Without Bird! Stainless Steel 7691 Tuna Hook. This awesome chain will do extremely well for Mahi and Billfish while also working well for Tuna! The Softy Chain comes ready to deploy in our popular 8 x 8 Lure bag. Now only $29.99! Sailfish, Marlin, Wahoo, and more. Made up of three of our 9" Tuna Bandits/"Machines" and a 12" Bandit Hook Bait. 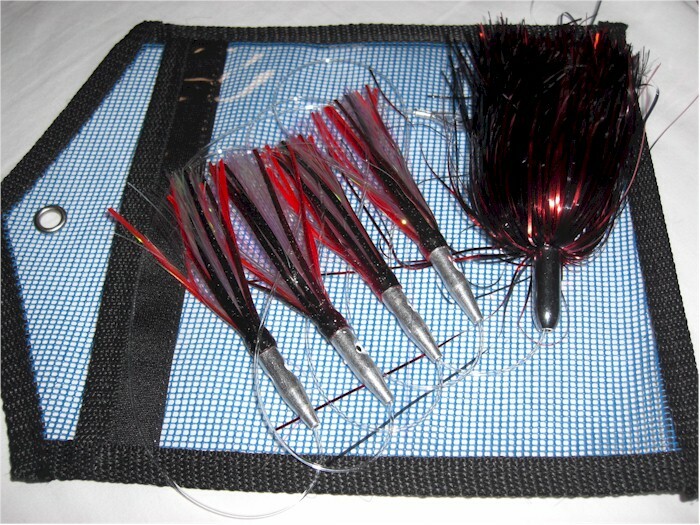 premium quality 10 x 10 inch Tormenter Lure Bags. Guaranteed for quality and to produce strikes. Winter time sale price - $44.99! of 9 fish on this rig one day! Guaranteed Results!! trailing hook bait. Rigged with Double Strength 7691 Stainles Steel Tuna Hook. 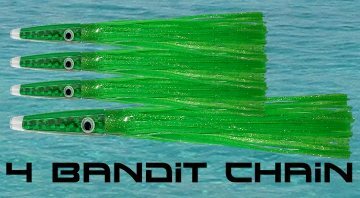 Now Rigged on 200lb Momoi are: four 11" Tormenter Squids and a Tormenter 12" Tuna Bandit as the trailing hook bait. Hook is now a Stainless Steel 7691 Double Strength 9/0 Tuna hook. NE Version has Spacer beads placing the hook at the very tail end while the Southern Version has no beads and the hook in the approximate center of the Cone Head. Loop protectors at both ends of the rig. Coms ready to deploy in our 8" x 13" Bag. Super Productive Daisy Chain that fish cannot resist! On its first day in the water this one (Blue & White) (in only 2 hours fishing) caught: a 12" Dolphin (proving that it will not scare off small fish), next a 45lb Dolphin, then a 15lb Dolphin, and then a 10lb Dolphin and finally an 8lb Dolphin. We caught two other Dolphin trolling during these two hours. One was on a 9" Green Tuna Bandit and the other on a Blue & White Steel Head. Stop wasting your money on Ballyhoo that take up space in your freezer that your fish should occupy! Your wife will be happy too! 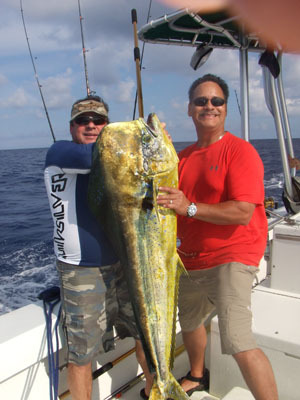 Great trolling for Dolphin, Trolling for Marlin, Trolling for Tuna, and even Wahoo. 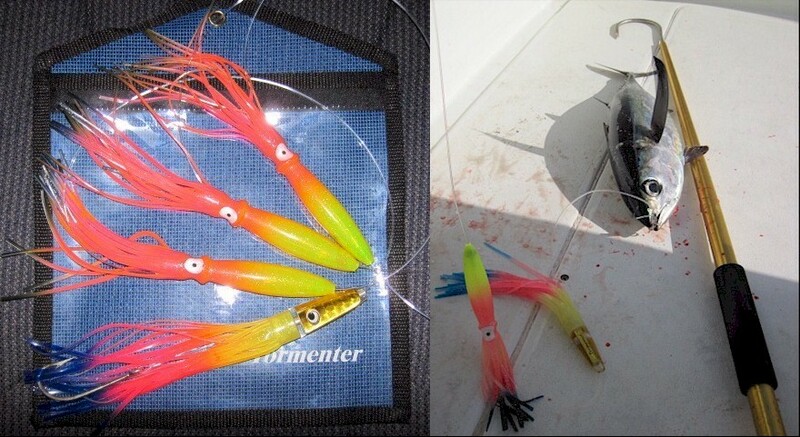 Now Rigged on 200lb Momoi are: four 9" Tormenter Squids and a Tormenter Tuna/Mahi Killer as the trailing hook bait. Hook is our own Stainless Steel 7691 Double Strength Tuna hook with spacer beads behind lure to place hook at end of the TMK. 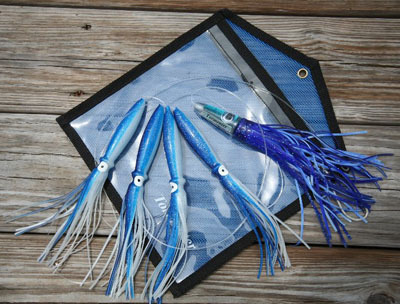 Ready to deploy in our 10x10 lure bag! ONLY - $37.99! 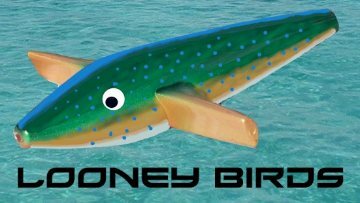 Add a 7" Looney Bird for ONLY $12! Sign up here to get fresh information including: "How To" videos,new products, sales, specials,new video posts,and other useful things that will increase your catches!